The OpenSimulator Archive (OAR) function has existed since OpenSimulator 0.5.9. The facility does a similar job to load-xml2/save-xml2 in that it saves prims so that they can be later reloaded. However, OpenSimulator archives (OAR) go a step further in that they can save all the necessary asset data so that you may fully restore the terrain, region parcel data, the textures of objects and their inventories when loaded onto a completely different system using a different asset database. to save an OpenSimulator archive. If no filename is given, then the name region.oar is used in the current directory. at the console. The location can be a filesystem path (as for "save oar") or an HTTP address to load an oar directly over the web. If no location is given, then the server looks for a file called region.oar in the current directory. See detailed "load oar" documentation at Load Oar. When an archive is loaded, owners will be restored if the relevant uuids can be found in the OpenSimulator installation's user database. Otherwise, prim ownership will default to the master avatar for the region. I recommend that you use filenames with the extension .oar. The filename extension of the download links on this page is .tar.gz which illustrates that the .oar format is actually a zipped tar file. If set, then objects in the saved oar are stripped of owner and last owner information, though not of creator information. This is useful if you are publishing OARs (rather than using them for backup) where those OARs might be loaded to the same grid from which you published. As of OpenSimulator 0.7.4, this switch will also strip ownership information from land parcels. As of OpenSimulator 0.8.0, this switch will also strip group information from the OAR. If the --noassets option is specified then the oar will be saved without assets. This can be handy if you're backing up the asset database separately and don't want the expense of including all the assets in each OAR. If the --home option is specified then all names of creators from this world will be appended with links to their home world. It is not required that the service be operational; the information will be added and it will be available in all worlds that import this OAR. <url> is the URL of this world's profile service. If the --perm option is specified then objects with insufficient permissions will not be saved to the OAR. The user whose permissions are checked is the estate owner. This can be useful for grids that allow their customers to export their regions to OARs, because it ensures that exporting to OAR can't be used to bypass content permissions. If the --all option is specified then the OAR will contain all the regions in the simulator. If this option isn't specified (which is the default) then the OAR will contain only the current region. This is an overview of the most common parameters. There are many more documented at Load Oar. If set, this will not attempt to load any of the assets from the OAR, though all other data will be loaded. This can be useful if you are loading the OAR back into a grid that you know already contains the assets. If the --merge option is specified then the oar will be merged with the existing region objects rather than replace them. The existing terrain, region settings and parcels will be left in place. By default, the save-oar command saves only the current region into the OAR (using OAR Format 0.8). However, if the --all option is specified then all the regions in the simulator are saved into a multi-region OAR file (using OAR Format 1.0). This is useful when saving a build that spans multiple regions. The load-oar command supports both OAR formats (0.x and 1.x). When it's given a 1.x OAR file it loads all the regions in the OAR into the corresponding regions in the simulator, according to their position relative to the root region. If the simulator doesn't have a region in a location that is present in the OAR then that region isn't loaded. The OpenVCE.net virtual worlds assets described at http://openvce.net/vwassets provided by Clever Zebra and the OpenVCE.net team at AIAI in the University of Edinburgh are available as an OAR (Opensim Archive) file. Please feel free to place links to other environments here, though unfortunately you'll have to host them on some other site. 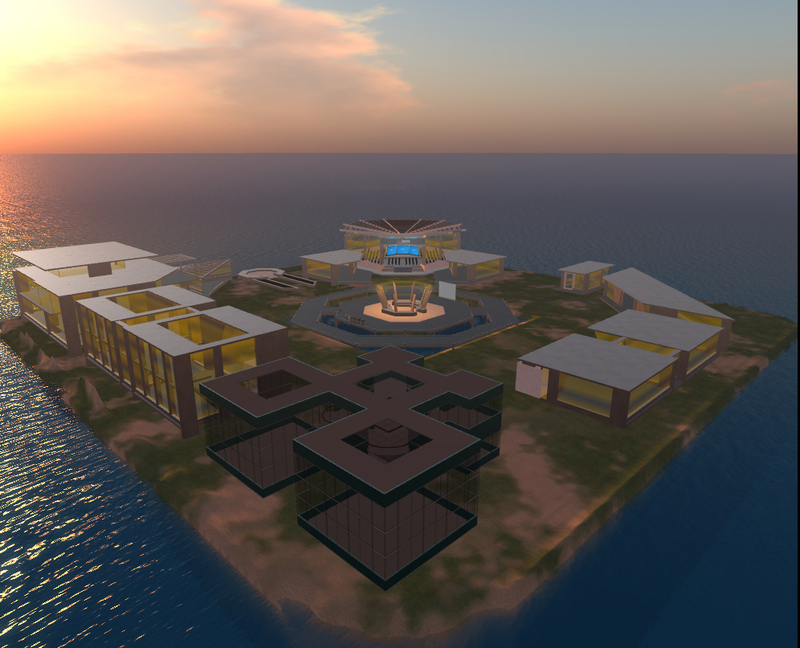 Where to get content for OpenSim -- Hypergrid Business page, regularly updated, containing links to major OAR sites. Also has download links to individual OAR files. - oarinfo.py, a very basic Python script for printing out information about an OAR (number of contained objects, assets, etc.). http://justincc.org/blog/category/oars/ - various OAR related articles from justincc, including background information and possible future development. 2. To distribute entire regions to other people. Loading large OARs using the default SQLite database plugin will take a very very long time (in the order of many hours). I highly recommend that you switch to MySQL if you want to load large archives. Make it easy for people to read and change individual objects, assets, etc. within an archive. Make it easy to compose two region archives into a single region archive. Make it easy to compose archives from scratch. Therefore, all the different entities (assets, objects, terrains, etc.) are packaged in individual files (e.g. one for each asset) with human readable filenames and machine readable extensions (e.g. .jp2 for textures, .txt for notecards). OAR Format 0.8 - the current default OAR save format. All version 0.x OARs can be read by any earlier version of OpenSimulator, even if some of the content is ignored. OAR Format 1.0 isn't backwards-compatible, so it can only be read in OpenSim 0.7.5 and above. However, since most current instances of OpenSim can't read this format, there is a transition period in which OpenSim still saves single-region OARs using OAR Format 0.8. This means that the most common behavior (save-oar for a single region) creates OARs that are readable by all instances of OpenSim. The new OAR Format 1.0 is only used when using the --all option. 1. What is this .tar.gz format you are using for the internal OAR format? Why not zip? .tar.gz is a standard unix way of zipping up files into a single larger compressed file for distribution. Windows users should be able to open these files using freeware programs such as 7-zip. I'm using .tar.gz because all the zip (and tar) libraries for .net are licensed either under the GPL (with exception) or under the MSPL. Unfortunately, not all members of the OpenSimulator development team are comfortable with the MSPL, so these libaries are not currently an option. It is also significantly easier to write code to create and read tar archives than zip archives. 2. Can you load and save multiple regions to an archive? 3. Can you load and save parts of a region to an archive? Though we will strive to maintain compatibilty for old archives with newer OpenSimulator versions, please don't rely on these archives as the only backup for regions. This page was last modified on 26 November 2016, at 17:31. This page has been accessed 225,073 times.